Protracted financial crisis in Europe continued to affect Malaysia's total exports while the slow economic recovery in USA and Japan as well as the GDP decelerations in China and India impacted the export momentum in 2012. Amidst the challenging global economic environment, Malaysia's total trade for 2012 reached a value of RM1.31 trillion compared with RM1.27 trillion recorded in 2011. Exports increased marginally by 0.6% to RM702.19 billion while imports grew by 5.9% to RM607.36 billion, resulting in a trade surplus of RM94.83 billion. Malaysia has had a trade surplus for fifteen consecutive years since 1997. Malaysia's top three trading partners were Singapore, China and Japan contributing RM95.5 billion, RM88.8 billion and RM82.9 billion respectively to Malaysia's total exports in 2012. The Malaysian timber sector's contribution of RM20.2 billion in 2012 was made up by exports of wooden furniture (32.3%), plywood (25.4%), sawntimber (12.2%), logs (8.4%), MDF (5.7%), BCJ (4.9%), mouldings (3.5%), particleboard (1.7%), veneer (1.6%) and other timber products (4.3%). 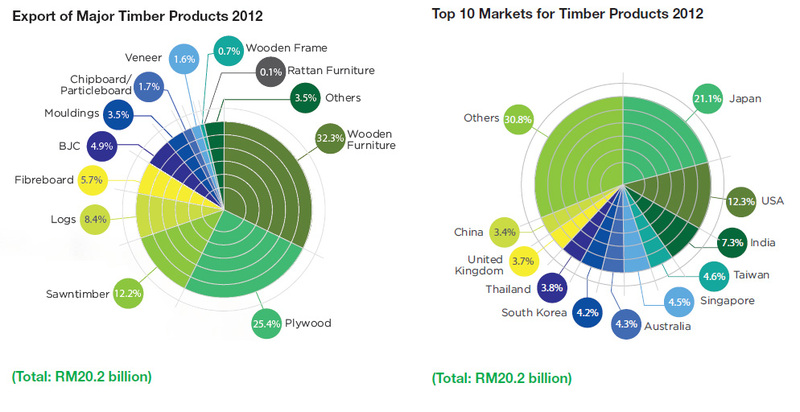 By region, Asia accounted for 64.6% of Malaysia's overall timber exports in 2012, an increase of 0.5% to RM13.1 billion. Asia, being the world's fastest growing consumer market with its rising income and a growing middle class, had propped up the global trade in 2012. Americas and Europe contributed 15.5% and 11.5% of overall timber export receipts respectively. Exports to Americas expanded by 10% (to RM3.14 billion), but Europe contracted by 6.5% (to RM2.33 billion). In 2012, Malaysia's timber exports to North America, West Asia, Central Asia and Europe (non-EU) registered impressive year-on-year growth rates of 10.4%, 20%, 20.9% and 21.7% respectively. Since 2008, Japan, USA and India have remained the top three major export markets for Malaysia's timber products, accounting for 40.7% of its overall global timber trade in 2012. Japan retained its position as the single largest destination with imports amounting to RM4.3 billion or 21.1% of Malaysia's overall timber exports. However, export receipts from Japan dropped by 7.3% compared to 2011. USA contributed 12.3% (RM2.5 billion) while India contributed 7.3% (RM1.5 billion) to Malaysia's overall timber export receipts. As the fourth largest export item, logs contributed 8.4% to Malaysia's total timber export earnings in 2012. Malaysia's export of logs fell by 13.4% to RM1.691 billion in value terms and declined by 9.2% in volume terms to 3,011,971 m3. By region, Asia was the largest export market for Malaysian logs, accounting for 99.86% of total logs export earnings. Shipment of logs to Asian countries declined by 9.1% to 3,011,112 m3 in volume and by 13.3% to RM1.689 billion in value in 2012. By country, India was the largest market for Malaysian logs accounting for 62.1% of Malaysia's log export receipts in 2012. Exports to India decreased by 7.4% to RM1.05 billion in terms of value and decreased by 2.8% to 1,826,844 m3 in terms of volume in 2012. Due to the increase in Malaysian log prices, many plywood manufacturers in India who used to import Malaysian logs had switched to Keruing logs from Myanmar. The main species imported by India were Balau, Meranti, Kapur and Keruing. China and Taiwan emerged as Malaysia's second and third largest markets, contributing 11.4% and 11.2% respectively. China's importation of logs amounted to RM193.4 million, a decrease of 7.6% and its volume fell by 10.2% to 350,615 m3 in 2012. This was mainly due to the usage of softwoods by China's plywood mills as the price is cheaper compared to tropical logs. Taiwan's uptake of logs also fell by 19.7% to RM188.9 million and volume fell by 12.6% to 338,094 m3 in 2012. Japan's ranking slipped to fourth position, with total imports plummeting by 41.7% in value terms to RM133.7 million and by 42.5% in volume terms to 207,197 m3. The stiff competition from softwood logs imported from Russia, USA, Canada and other European countries had also contributed to the reduction in Malaysia's log exports to China and Taiwan..
Sawntimber export value and volume contracted by 1.1% (to RM2.5 billion) and 1.2% (to 2,057,625 m3) respectively. 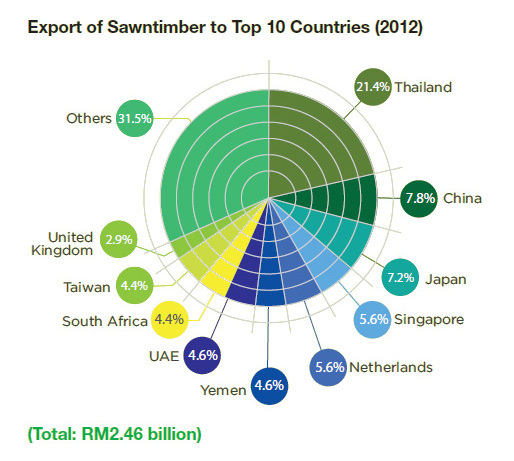 Sawntimber was the third largest export item, contributing 12.2% to Malaysia's overall timber export receipts in 2012. By region, Asia was the leading importer of Malaysian sawntimber, accounting for 75.1% of total sawntimber exports in 2012. Total imports by Asian countries increased by 6.2% to RM1.8 billion and 2.4% to 1,797,009 m3 in 2012. Europe's import of sawntimber dipped significantly by 24.4% to RM384.6 million in value and 25.1% to 147,848 m3 in volume terms. Residential construction was the largest construction category in the Dutch construction industry, with a 45.1% share of the industry's total value in 2012. Despite this, prospects for growth in the residential construction market remained bleak, as depressed economic conditions made it difficult for Dutch households to repay housing debts. Prospective buyers, especially those looking to buy property, as well as households looking to refinance their debt, were finding it difficult to secure mortgages. There seemed to be little improvement of this situation in the short term, as the Dutch government implemented measures to protect the banking system from the risk of large mortgage defaults, largely as a result of the economic slowdown following the financial crisis and resulting austerity measures. Thailand continued to be Malaysia's top importer of sawntimber, accounting for 21.4% of total export revenues in 2012. The country's uptake jumped by 13.5% to RM525.7 million although its volume decreased marginally by 0.6% to 632,755 m3 in 2012. After the floods at end-2011, Thailand's reconstruction spurred economic activities, generating higher imports of raw materials, including sawntimber. China and Japan were the second and third largest importers, accounting for 7.8% and 7.2% of total export respectively. However, China's import of Malaysian sawntimber fell by 26.6% to RM192.1 million in value, and 23.2% to 147,032 m3 in volume terms. China's growth in property sales slowed due to the Government's policy of tightening credit and administrative curbs on home purchases to prevent a housing bubble. In contrast, Japan recorded an increase in the import of sawntimber from Malaysia by 9.9% to RM177.9 million and volume up by 21.1% to 105,100 m3. Housing starts in Japan rose 10.3% in November 2012 from a year earlier, up for the third straight month according to the Ministry of Land, Infrastructure, Transport and Tourism, which was supported by a rush in demand before expected sales tax hikes and increased reconstruction activities in areas hit by the previous year's earthquake and tsunami. Plywood raked in the second highest export earnings, contributing 25.4% to Malaysia's overall timber exports in 2012. The plywood sector recovered from its downward trend in 2011 to positive territory in 2012 with exports increasing by 0.7% to RM5.14 billion in value and 7.4% to 3,406,086 m3 in volume terms. By region, Asia accounted for 84.4% of Malaysia's plywood exports with receipts reaching RM4.33 billion in 2012, an increase of 0.4% while export volume increased by 9.5% to 2,936,128 m3. Americas and Europe accounted for 6.2% and 4.2% of total plywood export receipts, valued at RM317.7 million and RM217.6 million respectively. Country-wise, Japan remained the largest buyer of Malaysian plywood, accounting for 49.5% in value terms of overall plywood exports in 2012. Japan's purchase of plywood from Malaysia was up by 7.5% to 1,608,922 m3, valued at RM2.542 billion, but this was a decrease of 6% in value terms year-on-year. Increase in the volume of plywood exported was mainly attributed to Japan's post-tsunami and earthquake reconstruction. South Korea overtook Taiwan to emerge as the second largest buyer of plywood from Malaysia in 2012. Plywood export volume to South Korea increased by 10.1% to 365,167 m3 while export value surged by 14.9% to RM495.3 million. Expansion of both the South Korean infrastructure and residential construction sectors contributed to the higher demand for Malaysian plywood. In comparison, Taiwan slipped to third position with total plywood imports from Malaysia valued at RM409.3 million, a decline of 6.8%, while volume dropped by 3.7% to 327,069 m3. 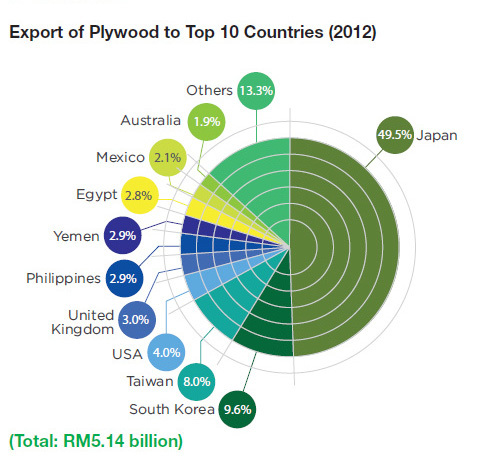 South Korea and Taiwan accounted for 9.6% and 8% respectively of Malaysia's total plywood exports in 2012. In 2012, the export value of veneer by Malaysia increased by 2.7% to 267,561 m3 while export earnings increased by 3.7% to RM333.2 million year-on-year. Similar to 2011, it accounted for 1.6% of the country's overall timber exports in 2012. By region, Asia remained the largest market for Malaysian veneers. It absorbed 95.7% of total veneer exports in 2012. Total value and volume recorded an increase of 4.6% to RM318.8 million and 2.9% to 262,503 m3 respectively. 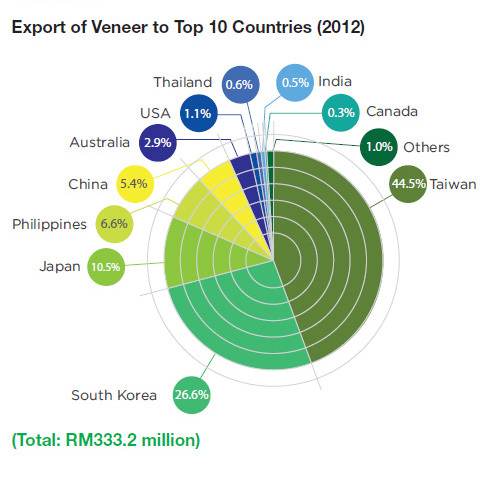 Taiwan, South Korea and Japan remained as the top three major markets for Malaysian veneer. Taiwan was the top importer with total imports valued at RM148.4 million, down 5.8% and import volume fell by 7.5% to 124,705 m3 in 2012. Malaysia's export of veneer to South Korea recorded an increase 45.8% in volume to 73,828 m3 and value by 52.4% to RM88.5 million in 2012. Japan, on the other hand, recorded negative growth in 2012. Export volume and value to Japan decreased by 12.5% and 4.2% to 16,605 m3 and RM35 million respectively. Medium Density Fibreboard (MDF) contributed 5.7% to Malaysia's overall timber exports in 2012. MDF export volume and value increased by 1.9% and 1.8% to 1,132,096 m3 and RM1.15 billion respectively. It was the fifth largest contributor to Malaysia's overall timber exports in 2012. 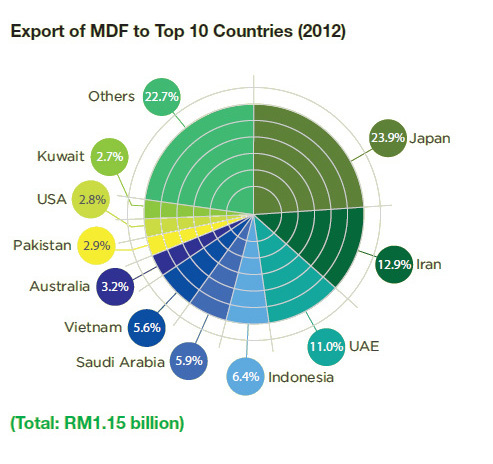 By region, Asia accounted for 90% of Malaysia's export receipts for MDF in 2012. Both export value and volume for MDF increased by 2.1% to RM1 billion and by 2.7% to 1,053,897 m3. Japan continued to be Malaysia's top importer, accounting for 23.9% of total MDF exports in 2012. The country purchased RM274.7 million worth of MDF, an increase of 7.3% and total volume increased by 6.4% to 161,964 m3 in 2012. Since the tsunami in March 2011. Malaysian MDF manufacturers had been shipping a huge portion of their production to Japan for the reconstruction of areas devastated by the earthquake and tsunami. Iran and UAE were close contenders with 12.9% and 11% of total MDF export receipts respectively. Total volume shipped to Iran rebounded by 22.6% to 156,040 m3, valued at RM148.8 million, an increase of 28.3% as compared to 2011. Iran has remained the second largest buyer of Malaysian MDF since 2010. The traditional MDF suppliers from Europe had ceased to do business with Iran due to the economic sanctions imposed on the latter, leaving a huge supply deficit. The shortfall in MDF supply to Iran was largely taken up by suppliers from Malaysia, China and Turkey. For UAE, shipments increased by value and volume terms to RM126.6 million (up 13.1%) and to 227,273 m3 (up 85.8%) in 2012. Apart from ongoing public projects in Abu Dhabi, several residential and commercial projects have been revived in Dubai, fuelling demand for MDF for various interior works. In addition, showrooms, retail outlets in malls, commercial offices underwent refurbishments and renovations which also required large volumes of MDF. 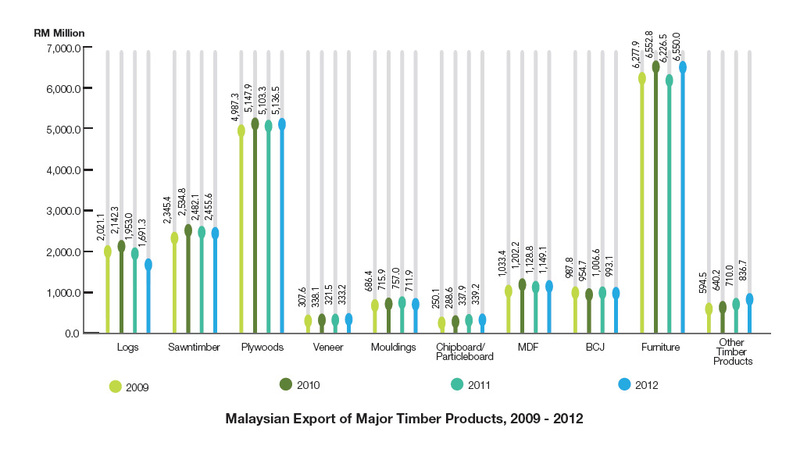 Mouldings contributed 3.5% to Malaysia's total timber export earnings in 2012. Export value and volume declined by 6% and 7.9% to RM711.9 million and 265,886 m3 respectively. By region, Europe was the largest market for Malaysian mouldings, accounting for 43.3% of Malaysia's total export of mouldings in 2012. Europe-bound mouldings export volume and value decreased by 6.3% and 6.5% to 106,021 m3 and RM308 million respectively. This was followed by Asia and the Oceania/Pacific regions which contributed 29.8% and 14.3% respectively to total export receipts. Export of mouldings to Asian countries decreased by 8.3% to 91,773 m3 in terms of volume and decreased by 7.6% to RM211.8 million in value terms. Export volume and value to the Oceania/Pacific region recorded a dip of 16.7% and 11.4% to 35,886 m3 and RM101.5 million respectively. 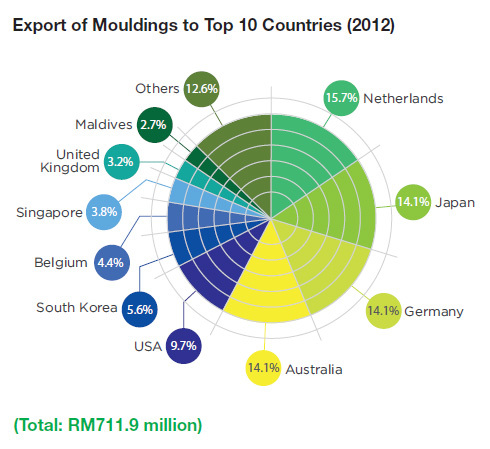 The Netherlands retained its position as the largest importer of Malaysian mouldings accounting for 15.7% of total mouldings exports in 2012. However, due to reduced activities in home improvement, refurbishment and DIY sectors, The Netherlands' import of mouldings decreased by 16% to 38,313 m3, valued at RM111.6 million, down 22.7% compared to the previous year. Japan and Germany trailed closely behind as the second and third largest markets, both accounting for 14.1% respectively. Shipments to Japan declined by 13.2% to 36,257 m3, valued at RM100.7 million, a drop of 13.2%. Meanwhile, Malaysia's export of mouldings to Germany increased both in volume and value terms by 13.3% and 16.1% to 33,205 m3 and RM100.4 million respectively. In 2012, Malaysia's export of Builders' Carpentry and Joinery (BCJ) registered a marginal decline of 1.3% to RM993.1 million. It contributed 4.9% of Malaysia's overall timber export receipts in 2012. By region, Asia was the largest market with total imports of BCJ amounting to RM472.4 million or 47.6% of total export of BCJ, an increase of 9.7% over 2011. Europe and Oceania/Pacific regions accounted for 30% and 12.3% in 2012. Europe's import of BCJ declined by 11% to RM298.2 million. Likewise, Oceania/Pacific's imports fell by 5.6% to RM121.7 million. 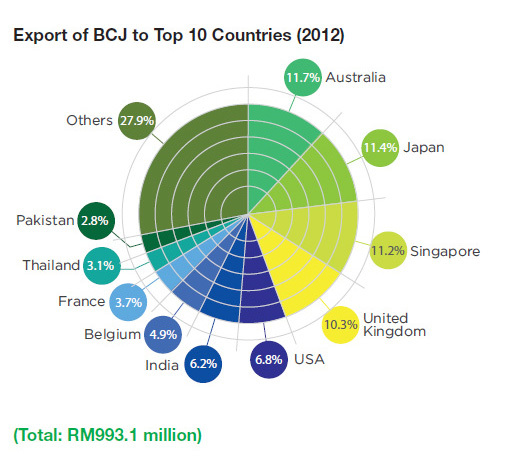 Australia was the leading importer of Malaysian BCJ in 2012 followed by Japan and Singapore. However, exports to Australia decreased by 5.2% to RM116.2 million due to poor housing starts. Following a 11.3% fall in housing starts in 2011, there was a further decline of 2.2% in 2012, to 147,610 units as home building was hampered by higher interest rates as well as a glacial pace of reforms in the Australian housing market. Meanwhile, export to Japan rose slightly by 2.4% to RM113.6 million in 2012. Likewise, Singapore increased its import of BCJ by 28.3% to RM111.6 million. Wooden furniture has been the largest export earner since 2007 for the country's wood-based industry. In 2012, export of wooden furniture expanded by 5.3% year-on-year, contributing 32.4% or RM6.5 billion, to Malaysia's export of total major timber products. 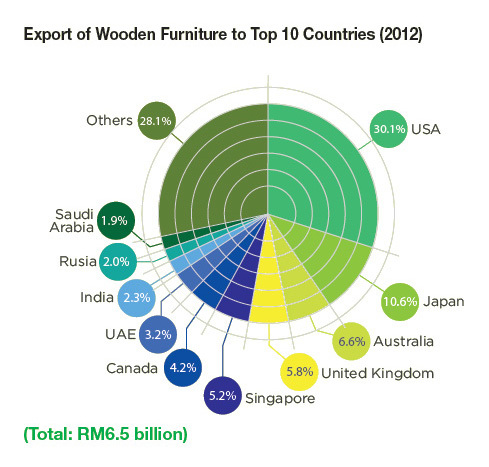 USA continued to be the single largest market for Malaysian wooden furniture, accounting for 30.1% of Malaysia's total wooden furniture exports in 2012. Benefitting from early signs of recovery in the US economy represented by improved housing starts and declining unemployment figures, Malaysia's exports to USA grew by 10.1% valued at RM1,964.8 million following a decline in exports by 14.1% in 2011. In 2012 Japan continued to rank as the second largest importer accounting for 10.6% of Malaysia's total export receipts for wooden furniture, although exports to Japan contracted by 10.5% to RM694 million. Meanwhile, Malaysian wooden furniture exports to Australia, the third largest export destination, rose slightly by 2.3% to RM427.8 million. United Kingdom's furniture import increased by 6.2% to RM377.6 million. Singapore, the fifth largest buyer of Malaysian wooden furniture since 2011, increased its import by 3.2% to RM338.9 million in 2012. Malaysia's timber export is expected to see growth above the 2012 levels in tandem with the solid growth momentum in Asia, despite the anemic growth of the US and the troubled European economies. It is hoped that Asia's continued growth, albeit at a slower pace, would translate into greater global demand for timber-based products, particularly valued-added items. The Eurozone may remain mired in recession, bogged down by the PIGS' (Portugal, Italy, Greece and Spain) sovereign debt and unemployment crises. Asian economies, led by China, have, in the last few years, shifted towards internal growth, particularly with rising income levels and generally young population feeding domestic investment and consumption. China would continue to be the largest economy in Asia and the biggest trading partner for most Asian economies, including Malaysia. Economists forecast growth could be even stronger in Asia in 2013, which has clearly outperformed other regions. On a more regional level, to circumvent international economic and financial uncertainties, ASEAN member states would undertake initiatives to forge closer collaboration in trade and investment within the region. These initiatives are expected to enhance intra-regional trade towards ASEAN Economic Community by 2015. Closer economic linkages with emerging economies in the region would help Malaysia and other participating countries diversity their markets and reduce over-reliance on the advanced economies. Although global growth is expected to increase in 2013, the World Bank contends that general economic recovery in a few major regions will remain fragile. Growth in high income countries would be weak and the export-dependent regions face risks from Europe's still unresolved sovereign debt crisis. According to World Trade Organisation, world trade growth fell to 2% in 2012 down from 5.2% in 2011 and is expected to remain sluggish in 2013 at around 3.3% as the economic slowdown in Europe continues to suppress global growth.